A large part of social media and digital content success comes down to listening to and communicating with our audiences. To be successful, we have to be willing to talk to our audience the way they want to be spoken to, while also actively listening to what they have to say. Bring the Message to the Audience. In many ways, that means bringing your message to your audience in a way that works for them. Sometimes that means being a bit of a chameleon. We’ve all learned various rules for formal writing, but you’ll see me break them here ALL THE TIME. Because this is a social media and digital content blog, not a dissertation. The audience I want to cultivate isn’t interested in a dissertation. The most important thing is to adapt the message content to the audience. In business as in life, we don’t always get to choose our audiences or the way they respond to the message. This remains true even if you hope to have high standards for your personal communication. It’s admirable to hold ourselves to high standards, but those standards can create a communications barrier when we require the same standards from others in the conversation. I ran across a recent article that really seemed to exemplify this problem. To put it lightly, the author was concerned with presenting a particular self-image and cutting out semantic phrases she viewed as self-sabotaging. The thing that strikes me about this excerpt isn’t the high personal standards of the author, nor her decisive and confident approach to communication. It’s a lack of self-awareness and a missed opportunity to hear what someone has to say. As soon someone says this, I no longer can listen to the rest of the conversation. I’m having a bit of fun, but you get the idea. Maybe it was just that an important client called and seemed agitated. Maybe it was that said client was dissatisfied with your service and planned to tell all her friends. I’m Calling This Irony (Situational). The irony of the situation is of course that, with her retort, the author is GIVING UP control of her self-image WHILE being self-sabotaging. We can expect high standards for ourselves, push to communicate clearly with everyone we encounter. There’s no real fault with that, but the problem comes with the expectation and judgement placed upon others. You may be thinking, yes, but this is a how-to career advice article. True, but this type of thinking tends to expand to other aspects of our lives. This is how we end up with the people who correct a stranger’s grammar in the checkout line! We can’t know what someone is going to say until they say it. And if all we’re worried about is how someone is going to communicate with us, we’re missing the point of the communication. I’m probably a little more sensitive than I normally would be or should be about this—I’ve just come out of a recent office experience where I was on the receiving end of something similar. A certain superior would interrupt me constantly, to fixate on what subject pronoun I was using. If I said “we,” I got “You have sole ownership of this project’s success.” If I said “I,” I got “This is a department initiative.” And yes, this was all for one project. There was no way that person was hearing anything substantive I was saying, because they were fixating on individual words—the how and not the what. And over time we experienced numerous communications breakdowns. I imagine there may be similar breakdowns happening for the author of this career article. Unfortunately, she may not be able to see it. A lot of times, there is a bright side to these kinds of situations, and I’d say that’s definitely the case here. Some measure of where I’m taking my life and my career right now is thanks to that situation, so that’s something to celebrate. And since I’ve been on the receiving end of that kind of behavior, I work extra hard NOT to do that to other people who approach communication differently than I do. I hope it makes me a better communicator, and a better person. 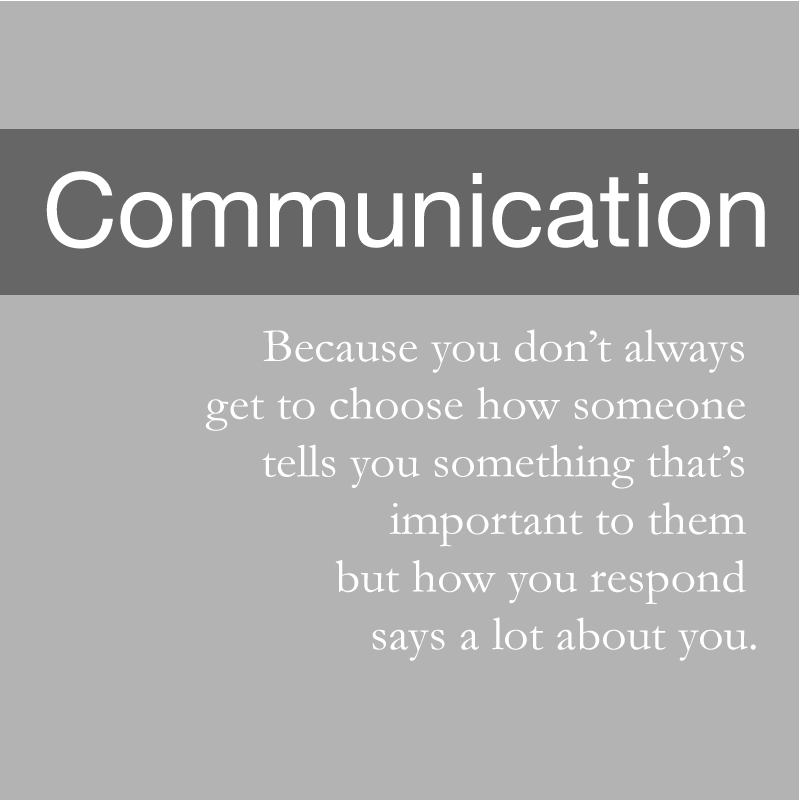 Because you don’t always get to choose how someone tells you something that’s important to them, but how you respond says a lot about you.